Can you believe it's already October? 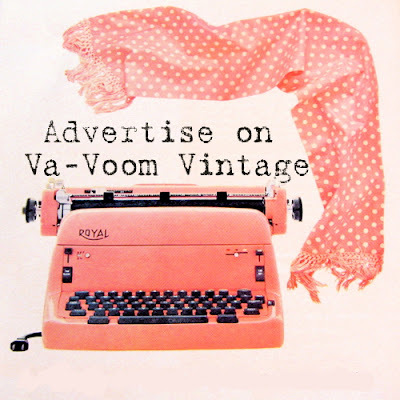 Get ready for those holiday sales with affordable advertising on Va-Voom Vintage. With 71,890 page views last month Va-Voom Vintage is an ideal place to advertise your business, blog or website. Va-Voom Vintage offers a variety of ad sizes to suit your advertising needs and budget. These ads will appear on my right sidebar for 30 days and will be linked to your site. If you would like help creating your ad button, jut drop me an email and I will be happy to assist! Purchasing ad space is easier than ever, just click the button below and it will walk you through a few quick steps. If you prefer, you can email me for a Paypal invoice and I will be happy to set up ads manually. I love to host giveaways, write sponsored outfits posts, product reviews and have shop or site owners guest post on my blog. In the past I have traded ad space in exchange for products as well. If you would like to collaborate on any fun advertising ideas, please contact me at the email address listed below.